EVGA GeForce GT 610 2GB DDR3 810MHZ Core Clock, 1000 MHz Memory Clock, 1620 MHz Shader Clock. 48 CUDA Cores, PCI-E 2.0, Memory Bit Width: 64 Bit, Memory Bandwidth: 8 GB/sec, Texture Fill Rate: 6.5 GT/s. 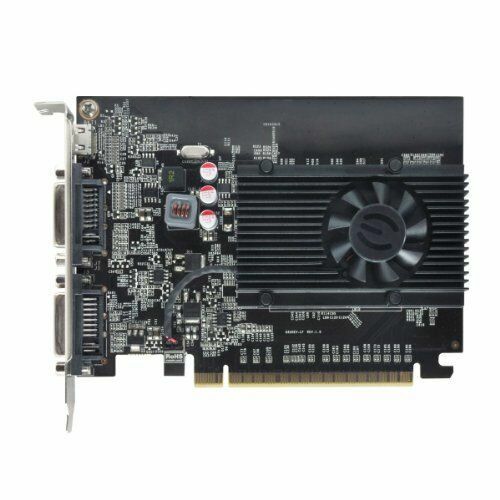 Features: NVIDIA PureVideo HD Technology, Blu-ray 3D Support, Microsoft DirectX 11 Support, NVIDIA CUDA Technology, NVIDIA PhysX Technology, Mini-HDMI, Dual-Link DVI, PCI Express 2.0 Support, OpenGL 4.2 Support. Great PCI card, for a low price. I was looking for replacement after my Dell Optiplex 780 kept crashing on me due to either a bad graphics card or bad drivers.., so I looked up this baby to see how that would turn out, once I installed it worked like a charm[ Note if you are considering to upgrading to Windows 10 make sure you remove all video drivers from Windows 7 for if you leave the Drivers in while upgrading to Windows 10 and install new video graphics drivers along with GForce Experience then you'll run the risk of overloading the card which will cause your system to crash so remove your old drivers before you upgrade to windows 10.] all in all a great PCI card. Video Card works very well.